Starring: John Turturro (Fioravante), Woody Allen (Murray), Vanessa Paradis (Avigal), Liev Schreiber (Dovi), Sharon Stone (Dr. Parker), Sofía Vergara (Selima), Tonya Pinkins (Othella), Aubrey Joseph (Cefus), Dante Hoagland (Coco), Isaiah Clifton (Cyrus), Michael Badalucco (Burly Driver), Aida Turturro (Driver’s Wife), Allen Lewis Rickman (Hasidic Driver). Producer: Bill Block, Paul Hanson, Jeffrey Kusama-Hinte; Director: John Turturro; Writer: Abraham Laboriel, Bill Maxwell; Director of Photography: Marco Pontecorvo (Color Lab); Music: Ken Thorne; Film Editor: Simona Paggi; Production Designer: Lester Cohen, Art Director: Sarah Frank; Set Decorator: Sheila Bock; Costume Designer: Donna Zakowska. Turturro wrote and directed this slight comedy drama in which he plays Fioravante, a cash-strapped florist who decides to become a professional gigolo as a way of making money to help his equally cash-strapped friend, Murray (Allen). With Murray acting as his manager, prompted by his dermatologist (Stone) requesting he find her someone willing to participate in a menage-a-trois, Tuturro quickly becomes a word-of-mouth hit. But when he is asked to help Avigal (Paradis) overcome the loneliness she still feels seven years after the death of her husband, he begins to question his choices. What starts out as a comedy, much akin to some of Allen’s own later efforts, turns into something of a parable in its second half with the tenderness Turturro’s character feels toward Paradis. Allen adopts the shyster screen persona he plays so well, notably in BROADWAY DANNY ROSE. Much of the film’s humour is derived from his enthusiastically entrepreneurial approach to his new role. But as the focus moves away from Stone’s spoilt loneliness to Paradis’ sad loneliness, the mood of the film turns more toward gentle drama. The shift in tone is undoubtedly deliberate, but betrays a movie that falls between two stools and fails to satisfy either camp completely. Turturro himself downplays his role too much thereby removing all emotion from the character, despite his obvious tender feelings for Paradis. 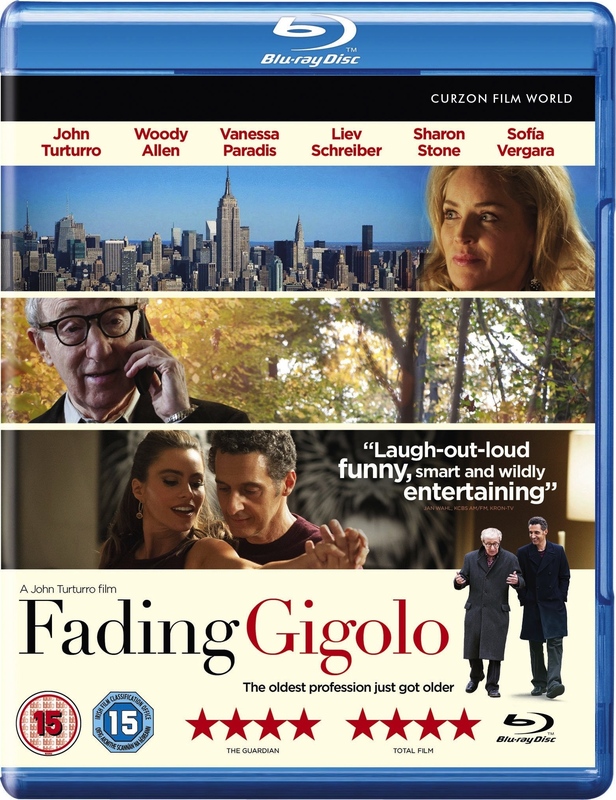 It is therefore left to Allen to give the movie its life and its most pleasurable moments and whilst FADING GIGOLO will only find a limited audience there is still enough there to make it enjoyable, as well as demonstrate it could have been better. Starring: Richard Harris (Lt. Cmdr. Anthony Fallon), Omar Sharif (Captain Alex Brunel), David Hemmings (Charlie Braddock), Anthony Hopkins (Supt. John McLeod), Shirley Knight (Barbara Bannister), Ian Holm (Nicholas Porter), Clifton James (Corrigan), Roy Kinnear (Social Director Curtain), Caroline Mortimer (Susan McLeod), Mark Burns (Hollingsworth), John Stride (Hughes), Freddie Jones (Sidney Buckland), Julian Glover (Commander Marder), Jack Watson (Chief Engineer Mallicent), Roshan Seth (Azad). Producer: Richard Alan Simmons (as Richard De Koker); Director: Richard Lester; Writer: Richard Alan Simmons (as Richard De Koker); Director of Photography: Gerry Fisher (De Luxe); Music: Ken Thorne; Film Editor: Antony Gibbs; Production Designer: Terence Marsh, Art Director: Alan Tomkins; Costume Designer: Evangeline Harrison. 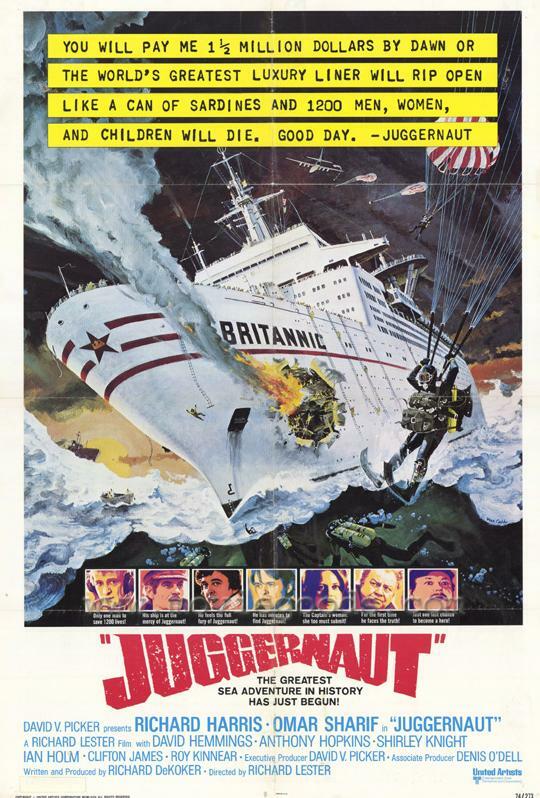 Like GOLD, which I reviewed recently, JUGGERNAUT is another unfairly overlooked film from 1974. Set aboard the Britannic, a cruise ship crossing the Atlantic on which seven bombs have been planted by an extortionist, the story wittily plays around with standard disaster movie conventions. This is largely down to director Richard Lester’s observational and down-to-earth approach to filmmaking. Whilst the standard genre approach around establishing multi-character backgrounds amongst the passengers is adopted, Lester inhabits the story with a quirkiness in characterisation that somehow makes them more real than those seen in the bigger-budget blockbsuters of the day such as EARTHQUAKE and THE TOWERING INFERNO. Lester is helped by an excellent cast including Hopkins as the detective tasked with tracking down the bomber, whilst his wife and family are aboard the Britannic. This situation could have become clichéd, but here comes across much more real due to the downplaying of the actors and Lester’s fly-on-the-wall approach to filming scenes. Harris is also on top form in the lead as the bomb disposal expert, Fallon, charged with de-activating Juggernaut’s seven bombs. Sharif plays the cold-hearted ship’s captain, involved in an affair with Knight whilst Kinnear is the other memorable performer as the ship’s entertainer, who won’t accept defeat in trying to lift the spirits of the passengers. Ian Holm, Julian Glover, David Hemmings, Freddie Jones and Clifton James all round out a diverse cast that keeps the film’s audience interested with their diverse characters. The tension mounts during the bomb defusing sequences, and using an actual ship to film on adds to the sense of realism. Lester intersperses all of this with his trademark observational humour and overdubbed asides. Whilst acknowledging the conventions of its genre, Lester brings a fresh approach to it, which makes for a winning formula. 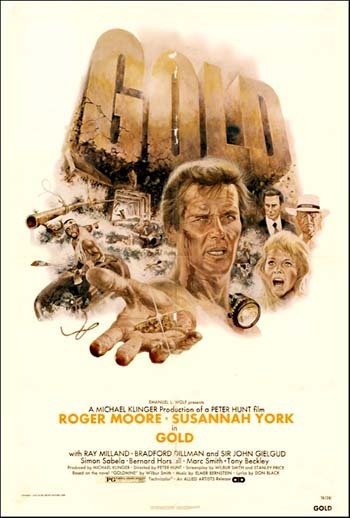 Starring: Roger Moore (Rod Slater), Susannah York (Terry Steyner), Ray Milland (Hurry Hirschfeld), Bradford Dillman (Manfred Steyner), John Gielgud (Farrell), Tony Beckley (Stephen Marais), Simon Sabela (Big King), Marc Smith (Tex Kiernan), John Hussey (Plummer), Bernard Horsfall (Dave Kowalski), Bill Brewer (Aristide), Norman Coombes (Frank Lemmer). Producer: Michael Klinger; Director: Peter R. Hunt; Writer: Wilbur Smith, Stanley Price (based on the novel “Gold Mine” by Wilbur Smith); Director of Photography: Ousama Rawi (Technicolor); Music: Elmer Bernstein; Film Editor: John Glen; Production Designer: Syd Cain, Alex Vetchinsky, Art Director: Robert W. Laing; Costume Designer: Marjory Cornelius. An overlooked film from the 1970s, this conspiracy action adventure story based on Wilbur Smith’s novel mixes exciting sequences underground with standard plotting and characters above it. Moore plays Rod Slater a mine manager who is set up as the fall guy by Dillman and his team of crooked investors. Their scheme is for Moore to flood the mine with water, whilst he believes he is drilling a new area for gold, and thereby raise the price of gold so Dillman and his crew can cash in. Moore is excellent as Slater instilling more energy and emotion into the role than in his James Bond movies of the same vintage. In fact many of the Bond crew are on hand here. Peter Hunt, who directed one of the very best Bonds in On Her Majesty’s Secret Service, livens the film with his trademark fast editing, supported by future Bond director John Glen, during the action scenes and significantly heightens the tension. The finale is particularly well staged as Moore and Sabela battle their way through the flooding mine in an attempt to seal it with explosives. The supporting cast is strong too with York good as Dillman’s wife and Moore’s love interest; Milland suitably grumpy as the mine owner and Dillman conniving as the director of operations. Gielgud, however, is wasted in a smaller role as the head of the investment syndicate. With grippingly authentic and well filmed mining scenes making up for those above ground, which sometimes drag, this is a neat movie that deserves some re-appraisal. 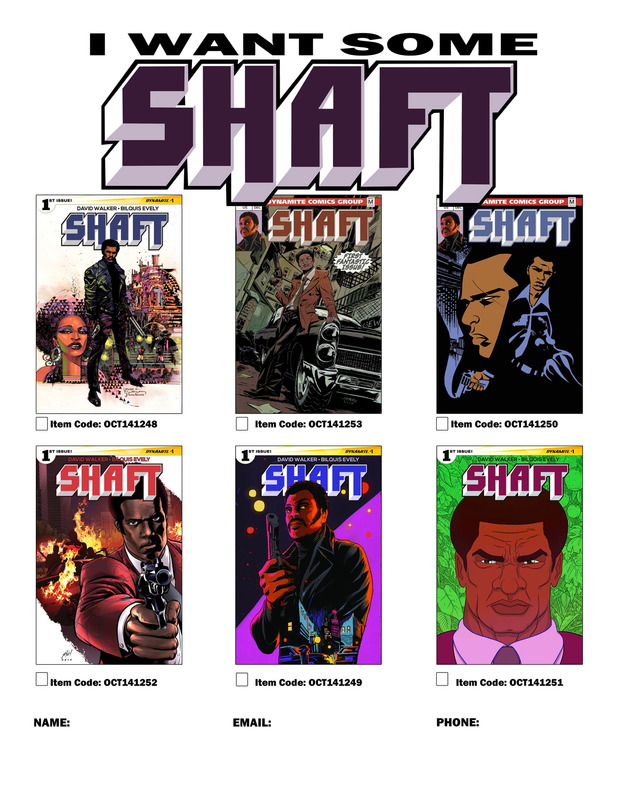 There is a great interview with David Walker writer of the new Shaft comic book on the Comic Alliance website. In the interview Walker covers the history of the character and his plans for both the comic books and new prose. Walker has been commissioned for six issues but has sufficient material for twenty four. 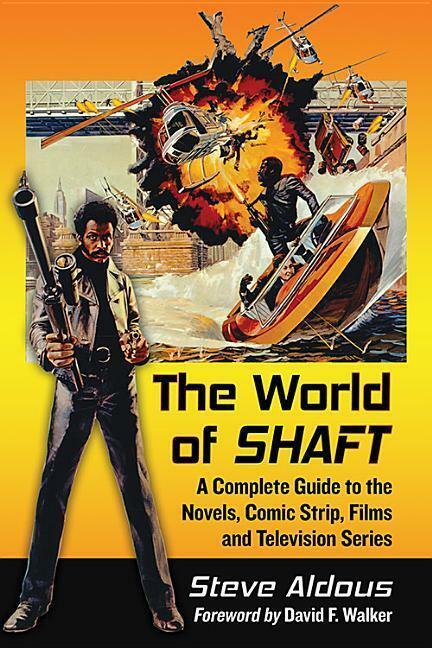 He also has a desire to adapt the first Shaft novel. Also on the site are the below example panels minus the dialogue and prose. 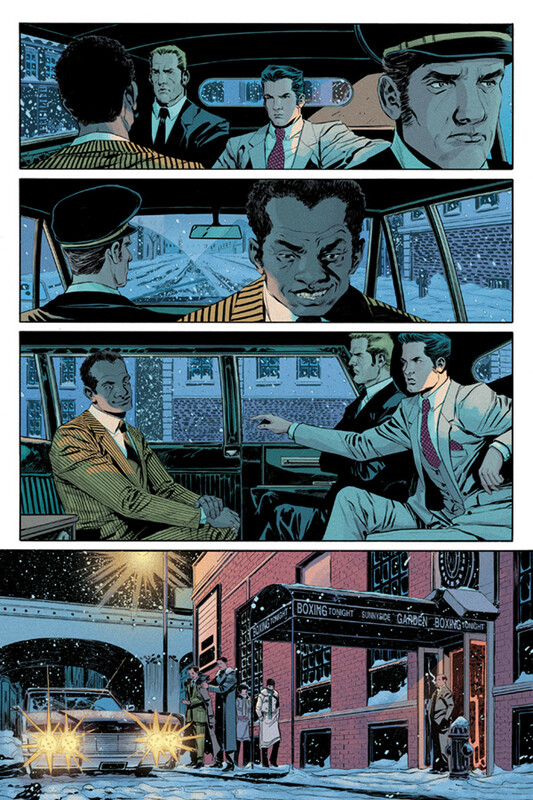 This is the first glimpse of artist Bilquis Evely’s excellent work. 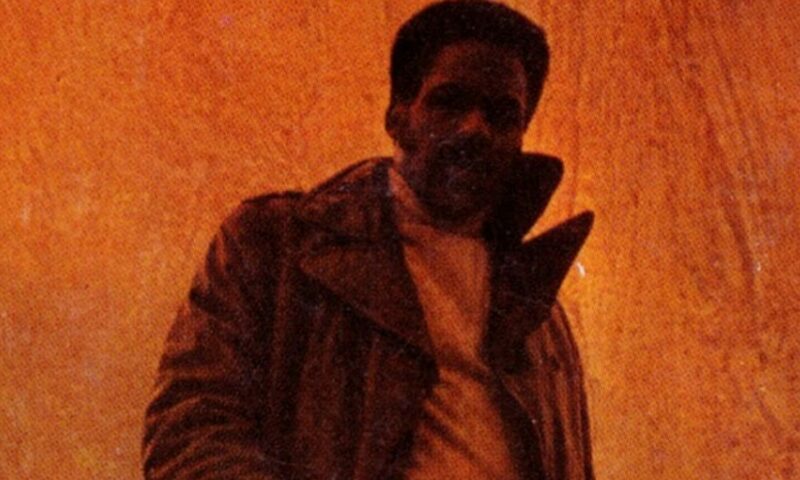 As Walker points out in the interview the physical depiction of John Shaft is based on Ernest Tidyman’s description and not Richard Roundtree. I look forward to receiving the first issue published on 3 December 2014. I have ordered the Denys Cowan and Bill Sienkiewicz cover variant (top left of the six choices). The series will form an origin story set one year before Ernest Tidyman’s 1970 novel. I will post reviews of the series here as the comics are published. Blurb: A thirty-year-old case is being reopened, and Rebus’ team from back then is suspected of foul play. With Malcolm Fox as the investigating officer, are the past and present about to collide in a shocking and murderous fashion? And does Rebus have anything to hide? 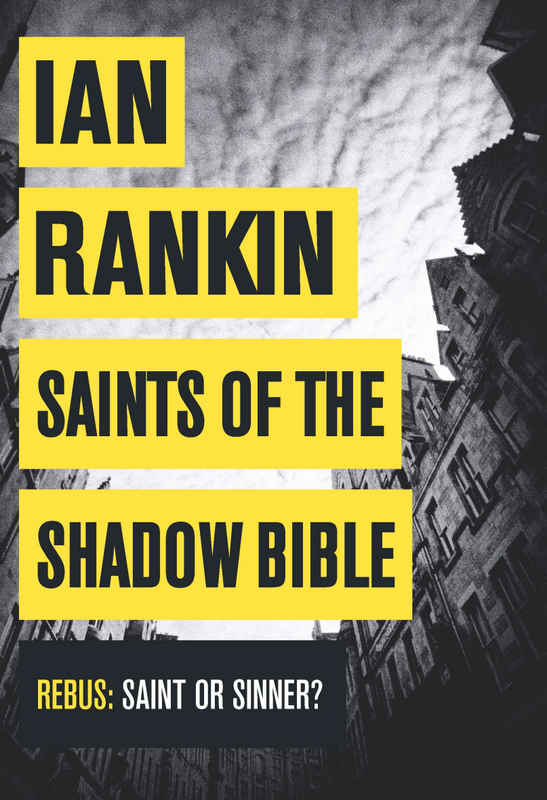 His old colleagues call themselves “the Saints” and swore a bond on something called “the Shadow Bible”. But times have changed and the crimes of the past may not stay hidden much longer. Rebus is out of retirement and back on the force – although at the lower rank of Detective Sergeant with Siobhan Clarke now his boss, having ascended to his old rank of Detective Inspector. The case they are working is a car accident where the driver has fled the scene of the crime, but all is not as it seems as the plot thickens to involve local gangsters and a rich businessman. This give Rankin ample time to bring Rebus’ cynicism with both authority and big business to the fore. Alongside this, the main plot around the death of a local low-life who had escaped prison thirty years previously – seemingly due to police ineptitude – looks like implicating the team Rebus joined as a Detective Constable when he began his career with CID. The relationship between these old-school veteran cops is strained and we also meet an old flame of Rebus as well as a potential new love interest. Rankin weaves these two separate plots cleverly and the characters retain their interest throughout. He also allows us brief glimpses inside other characters – a variance from his usual focus on Rebus and Clarke. Whilst the book is not as strong as the best entries in the series – its recurrent themes give it a feeling of familiarity – it is still an entertaining read. Rebus is a fantastic creation and it is great to see him back. 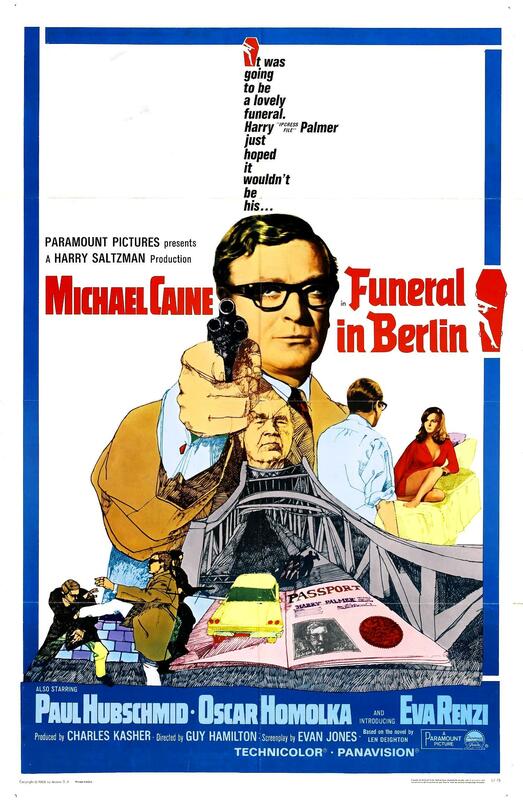 Starring: Michael Caine (Harry Palmer), Paul Hubschmid (Johnny Vulkan), Oskar Homolka (Col. Stok), Eva Renzi (Samantha Steel), Guy Doleman (Ross), Hugh Burden (Hallam), Heinz Schubert (Aaron Levine), Wolfgang Völz (Werner), Thomas Holtzmann (Reinhardt), Günter Meisner (Kreutzman), Herbert Fux (Artur), Rainer Brandt (Benjamin), Rachel Gurney (Mrs. Ross), John Abineri (Rukel), David Glover (Chico). Producer: Charles Kasher; Director: Guy Hamilton; Writer: Evan Jones (based on the novel by Len Deighton); Director of Photography: Brian Elvin (Technicolor); Music: Konrad Elfers; Film Editor: John Bloom; Production Designer: Ken Adam; Art Director: Peter Murton; Set Decorator: Michael White, Vernon Dixon. In this solid follow-up to 1965’s THE IPCRESS FILE, British agent Harry Palmer (Caine) is sent to Berlin to receive a Communist defector (Homolka), but the true situation turns out to be rather more complicated. The plot twists and turns and Caine is again highly watchable and droll as Palmer. But whilst the first film indicated a desire for exec producer Harry Saltzman to move away from the James Bond formula, in this second outing there are increasing nods toward his prime asset. This would be taken even closer with the third film in the series – BILLION DOLLAR BRAIN. In the meantime, Jones’ competent adaptation of Deighton’s complex novel keeps the viewer engaged. The production credentials are strong with great use of the Berlin locations, tight, if safe direction from Hamilton and a good supporting cast adds some energy to the proceedings. The familiarity of the ingredients had been well and truly set by this point and the genre would become increasingly inhabited by far-fetched spoofs and parodies. Starring: John Phillip Law (Sinbad), Caroline Munro (Margiana), Tom Baker (Koura), Douglas Wilmer (Vizier), Martin Shaw (Rachid), Grégoire Aslan (Hakim), Kurt Christian (Haroun), Takis Emmanuel (Achmed), David Garfield (Abdul), Aldo Sambrell (Omar). Producer: Charles H. Schneer, Ray Harryhausen; Director: Gordon Hessler; Writer: Brian Clemens (from a story by Clemens and Harryhausen); Director of Photography: Ted Moore; Music: Miklos Rozsa; Film Editor: Roy Watts; Product ion Designer: John Stoll; Art Director: Fernando Gonzalez; Set Decorator: Julian Mateos; Special Visual Effects: Ray Harryhausen. A throwback to the adventures of the late fifties and early sixties that at the time of its release was a welcome departure from the urban thrillers dominating early 1970s cinema. Here, Sinbad (Law) and his crew intercept a homunculus carrying a golden tablet. Koura (a pre-Doctor Who Baker), the homunculus’ creator and practitioner of evil magic, wants the tablet back and pursues Sinbad. 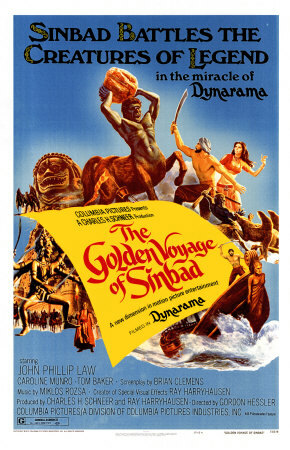 Meanwhile Sinbad meets the Vizier (Wilmer) who has another part of the interlocking golden map, and they mount a quest across the seas to solve the riddle of the map, accompanied by a slave girl (Munro) with a mysterious tattoo of an eye on her palm. They encounter strange beasts, tempests, and the dark interference of Koura along the way. Whilst the effects may seem quaint compared to the modern-day CGI approach, they also give this tale its charm and the creatures carry more personality as a result of Harryhausen’s legendary stop-motion approach to animation. The pace improves as the story progresses with good action scenes centred around battles with mythological creatures pumped along by a strong score from Rozsa. The quest plot is a familiar hook for fans of the genre and whilst the film does not match the heights of JASON AND THE ARGONAUTS or even THE 7TH VOYAGE OF SINBAD. This is still pleasingly entertaining escapism for kids of all ages. Robert Shaw had pitched for the role of Sinbad but settled for an uncredited role as the Oracle, for which his face was heavily swathed in make-up and his voice electronically altered by a sound engineer. Followed by SINBAD AND THE EYE OF THE TIGER in 1977. Starring: Henry Fonda (Manny Balestrero), Vera Miles (Rose Balestrero), Anthony Quayle (Frank D. O’Connor), Harold J. Stone (Det. 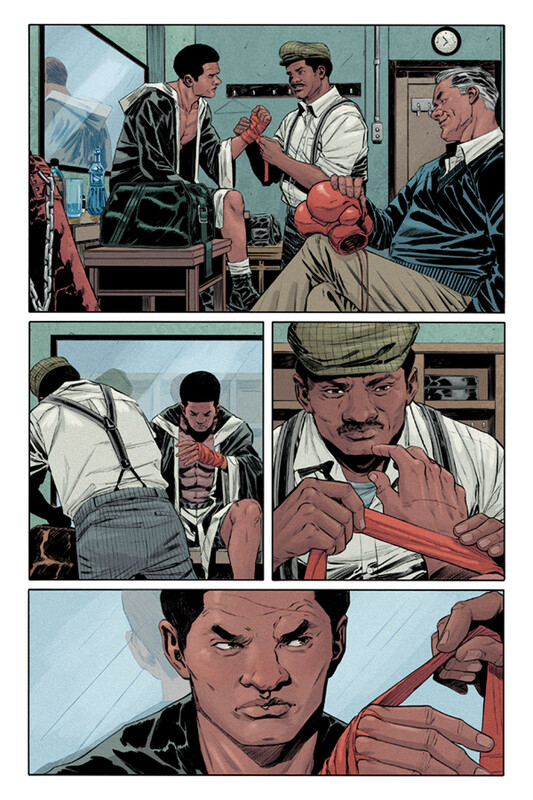 Lt. Bowers), Charles Cooper (Det. Matthews), John Heldabrand (Tomasini), Esther Minciotti (Mama Balestrero), Doreen Lang (Ann James), Laurinda Barrett (Constance Willis), Norma Connolly (Betty Todd), Nehemiah Persoff (Gene Conforti), Lola D’Annunzio (Olga Conforti), Kippy Campbell (Robert Balestrero), Robert Essen (Gregory Balestrero), Richard Robbins (Daniel), Dayton Lummis (Judge Groat), Peggy Webber (Miss Dennerly). 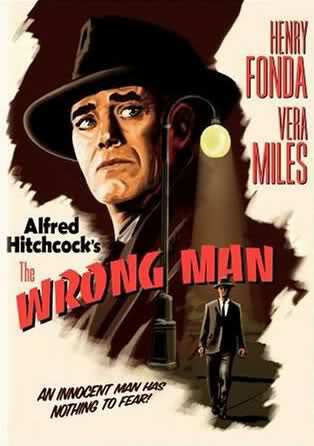 Producer: Alfred Hitchcock; Director: Alfred Hitchcock; Writer: Maxwell Anderson, Angus MacPhail (from a story by Anderson); Director of Photography: Robert Burks; Music: Bernard Herrmann; Film Editor: George Tomasini; Art Director: Paul Sylbert; Set Decorator: William L. Kuehl. Hitchcock himself introduces this intriguing adaptation of a true story of Manny Balestrero (Henry Fonda), who makes little money as a musician. When his wife (Vera Miles) needs some dental work, Manny attempts to cash in on her insurance policy. Unfortunately, he resembles an armed robber who held up the office twice before, so the police are called and Manny is placed under arrest. Where the film scores is in the unfolding psychological drama. As Manny retains a certain calmness as he attempts to prove his innocence, his wife Rose becomes increasingly strained mentally leading her to an eventual breakdown. Fonda and Miles capture the essence of their characters very well as the story unfolds in a matter-of-fact fashion. Herrmann also contributes another evocative score that conveys the increasing desperation of the couples’ situation. Hitchcock also uses the New York locations (including the city’s Stork Club) effectively, which are captured moodily through Burks’ camera work. The director deliberately steers away from any visual tricks and lets the story speak for itself. As such it is one of his most straightforward films. Balestrero’s story had previously been dramatised on Robert Montgomery Presents in an episode entitled “A Case of Identity,” which aired on 11 Jan 1954 on the NBC network based on the Life magazine article bearing the same title. Starring: Clive Owen (Mac), Andrea Riseborough (Colette McVeigh), Gillian Anderson (Kate Fletcher), Aidan Gillen (Gerry), Domhnall Gleeson (Connor), Brid Brennan (Ma), David Wilmot (Kevin Mulville), Stuart Graham (Ian Gilmour), Martin McCann (Brendan). Producer: Chris Coen, Ed Guiney, Andrew Lowe; Director: James Marsh; Writer: Tom Bradby (based on his own novel); Director of Photography: Rob Hardy (DeLuxe); Music: Dickon Hinchliffe; Film Editor: Jinx Godfrey; Production Designer: Jon Henson, Art Director: Aeveen Fleming; Costume Designer: Lorna Marie Mugan. The opening set-up of this adaptation of Tom Bradby’s novel in 1973 Belfast produces the most haunting scenes of the film and establishes Riseborough’s burden of guilt over the death of her little brother, who was shot after she sent him to the shops on an errand. When twenty years later she is finally convinced it was the IRA who were responsible, she uses that guilt to spy on her own brothers – Gillen and Gleeson – with Owen as her MI5 guardian. There are a few twists and turns in the plot as the tale unfolds to its logical conclusion. Performances are good – notably Brennan as the family matriarch and Wilmot as the IRA’s fixer. Riseborough’s relationship with her own son is meant to symbolise her redemption for the loss for her brother, yet Marsh directs this with a cold realism. The film’s focus on Riseborough and her family also leads to a sense of detachment from the community and the ongoing tensions – excepting for one scene with a flag-waving funeral. As such there is a lost opportunity to further explore the family’s continued fight being at odds with the changing political climate. Marsh keeps the tension and drama bubbling under the surface whilst building deliberately to the climax. His use of Owen and Anderson as MI5 agents is interesting after early set-ups they stay on the periphery of the story, although their characters’ differing methods do provoke the final twist that ignites Riseborough’s anger and action. Although this is a credible adaptation I am still left with the feeling it could have been even better had it been adapted for TV as a mini-series and the characters and scenarios had even more room to breathe.